1. 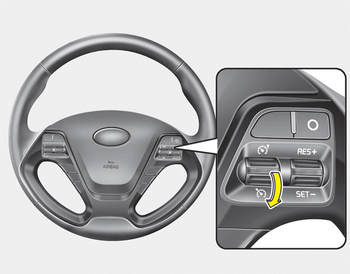 Move the lever down ( ) on the steering wheel, to turn the system on. The cruise indicator light will illuminate. 2. Accelerate to the desired speed, which must be more than 30 km/h (20 mph). For manual transaxle vehicles, you should depress the brake pedal at least once to set the cruise control after starting the engine. 3. Move the lever down (to SET-), and release it at the desired speed. The cruise set indicator light will illuminate. Release the accelerator pedal at the same time. The desired speed will automatically be maintained.